Your adventure begins in Punta Arenas, Chile, the most populated city in southern Patagonia. Your charter flight from Punta Arenas to Antarctica will have you crossing the legendary Drake Passage in only a few hours. There are few places in the world as evocative as Antarctica. As your ship approaches the white continent, you may be overcome by feelings of excitement and awe. 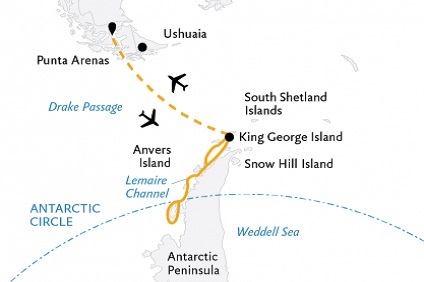 Crossing the Antarctic Circle is an impressive achievement, as most expeditions to the Peninsula do not reach 66° 33' S.
If you haven’t had your fill of Antarctic wildlife and icebergs by now, you’ll surely be satisfied by the time we return to King George Island. After your week of exploration, you’ll say goodbye to the Expedition Team and disembark at King George Island.